When travelling around the Valley of the Sun, baseball fans are constantly running into brand new ballparks that are stocked with bells and whistles, built right next to highways, and that cater to the fan who is coming to Arizona looking to spend their money. When it comes to Maryvale Baseball Park, spring home of the Milwaukee Brewers, those ideas immediately get turned on their head. The park was opened in 1998 and has been the home of the Brewers ever since, and the location is a bit of a headache. It’s not located far from downtown at 51st Avenue and Indian School Road, but that neighborhood feel comes with a price as traffic can be a nightmare if a big-ticket team like the San Francisco Giants or Chicago Cubs are visiting. In addition to the difficulty in actually getting into the ballpark parking lots (which are reasonably priced, costing just $5 to park in), there’s the difficulty in getting anything to eat once you get into the park. Normal games during the week aren’t bad when it comes to concessions, but if you’re there on a weekend or are there when it’s a big time game, the concession lines are a tough slog and can take upwards of an inning or two to navigate. Once you get up to the window however, things begin to improve. The menu isn’t extensive at the park’s main concession stands, but it’s hard to resist a bratwurst or an Italian sausage when faced with the choice. Unlike some of the other older ballparks in the Valley, the food is fresh and delicious, and it almost makes the wait worthwhile. If you’re not into standard ballpark fare, there are plenty of options to explore behind home plate. In addition to craft brewers and Wisconsin staples like Leinenkugel’s if you want to live up to the team's nickname, there is plenty to eat. Whether you’re looking for handmade noodle bowls, Mexican fare like burritos and quesadillas, or a Wisconsin institution like fried cheese curds (they really hit the spot on a warm, sunny afternoon), there is plenty to look at as you work your way through the extensive food court area. When you actually get to your seats at the ballpark, there are a couple of things you’ll notice right away. The first is that there isn’t a seat that’s terribly far from the field. The seating area holds only about 7000 people, so fans are guaranteed to be close to the action. The second thing that jumps out is the amount of shade present. The trellised roof extends all the way around the ballpark, leaving the back rows in constant shade and working its way up through the grandstand as the warm Arizona sun moves through the sky. In fact, an interesting quirk of the ballpark is the lawn seating down the right field line. Some fans eschew lawn seating because of the intense heat and constant exposure, but thanks to the way the park is designed, that area stays in nearly constant shade throughout the game, and fans can sit back and relax in comfort without having to shell out extra money for a seat. Speaking of shelling out extra money, do yourself a favor and make sure to get a seat in the field boxes if you’re wanting to sit in the grandstand. The infield reserved and outfield reserved seats are actually metal bleachers, and if you’re unlucky enough to sit in a spot that gets a lot of sun during the game, your seat will get quite toasty as the afternoon wears on. 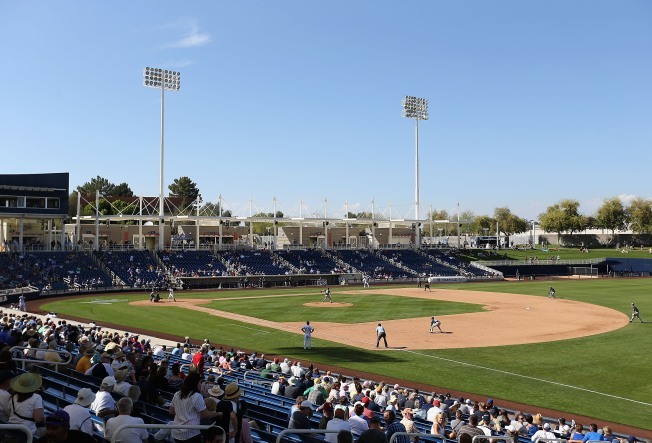 With the metal bleachers, the sometimes-long concession lines and the difficult traffic around the ballpark, it’d be easy to write off Maryvale as a place to avoid on a Cactus League trip. In spite of those obstacles, there is still plenty to like about the ballpark, and if you’re willing to go to a weekday game or a contest against a team that doesn’t draw half of its fanbase to the desert every spring, it’s a good place to catch a game.